Call us today to open your FREE Currency Account - You CAN SAVE A SMALL FORTUNE! Our clients have literally SAVED €1,000's on their Spanish property transaction, mortgage payments when moving money around. It's your hard-earned money, so hold on to it for a bit longer! Hondon Villas regularly use and recommend MoneyCorp, our chosen currency exchange experts. They have the service reputation and global reach that surpasses any other exchange company we have used. We have literally saved our clients 1,000's and 1,000's by suggesting MoneyCorp over their normal bank. And using them will ensure you continue to save money in the future, whether you need to send large sums halfway around the world or take a few hundred on a holiday. Bigger, better, more efficient with 35 years of expertise* : MoneyCorp help millions of clients every year with their foreign exchange and international payment requirements. Their web site has the most advanced 'real-time' currency system we have seen. It is very easy to check rates, request information or do a deal. 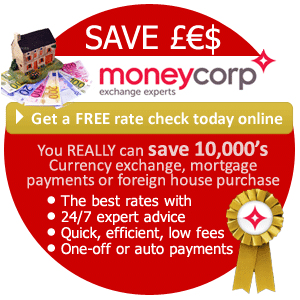 *MoneyCorp were established in 1962 and have been trading currencies since 1979. Last year, they transacted in excess of £10 billion in foreign currencies on behalf of clients. They have approx.' 1000 employees and deal in over 100 currencies. Just like Hondon Villas, MoneyCorp want to ensure your property purchase/sale goes smoothly. And we know MoneyCorp will help you all the way: online or via one-to-one calls. It's FREE TO CHECK THEIR RATES and OPEN AN ACCOUNT. You'll be able to make urgent one-off payments, elect to diarise a money transfer or target a particular exchange rate in the future. The main advantages of using a currency exchange is YOU GET BETTER RATES over banks and you can CHECK THE RATES YOURSELF online or phone 24/7. MoneyCorp will get you the best possible rate whether your exchange is same-day urgent, a few months away or a monthly payment such as a mortgage or living allowance. FLEXIBLE and EASY: You can automatically send overseas payments at a schedule you've set. You can even fix the exchange rate for up to two years. Great for paying mortgages and bills, or transferring pensions and salaries. MoneyCorp take no % commission (unlike some banks, Bureau de Change, Post Office or a Travel Agent) and their transaction fees are as low as £5. None of the above is usually available through your own bank, plus you are likely charged higher transaction fees with much poorer exchange rates. Professional, knowledgeable and re-assuring : "Moneycorp were excellent and they ensured the transfer of our funds in Euros was both smooth and timely. The overall customer service was brilliant and we had regular contact with our dealer Simon Lowy. He was professional, knowledgeable and re-assuring throughout the very stressful few months leading to completion." - a property buying client.